Spring break has arrived, and boy did we start it with a bang! 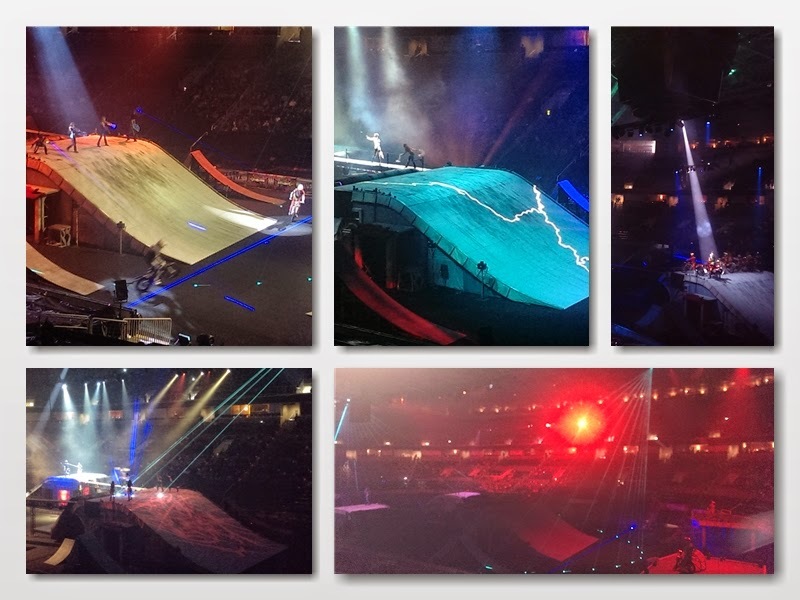 We saw Feld Entertainment's amazing freestyle motorcross stunt show, Nuclear Cowboyz, over the weekend. The Pea gave her ticket up to spend the day with a friend, so 3Po and Jammy invited a friend, and all 3 boys loved the whole show. Actually, I should say all 4 boys, because Alfie enjoyed it as much as the boys did! It's chock-full of high-flying stunts and tricks that left us gasping and yelping in disbelief. We were literally on the edge of our seats! The excitement and energy levels were high even before the show started. Vendors were selling cotton candy with a special Nuclear Cowboyz beanie, mohawk headbands, and some really cool Nuclear Cowboyz shirts. There was a section roped off for autograph signing after the show. When we peeped into the show area, we were amazed by the height of the ramps and runways! Most were taller than a one-story house, and they must have been spaced at least 50 feet apart. Some were connected by narrow catwalks or smaller ramps. The whole setup looked unbelievably scary. One of the best tricks of the night was so spectacular, I didn't even have time to take a photo of it. One of stuntmen was riding around with his back on fire. Yes, the dude was On. Fire. Both literally and figuratively. It was the only time during the whole show that anyone had performed a trick like that, as opposed to all the other tricks, which were repeated quite a few times over the course of the show. That made the Flaming Dude even more of a moment to treasure. 1) In between motorcycle stunts, the Shaolin Kung Fu warriors kept everyone enthralled by their kung fu performances; my favorite parts were when one of the warriors broke a pole over another warrior's head, and when another warrior balanced himself on the tip of a spear (he ended up horizontal, with the only the tip of the spear touching his stomach. How he escaped impalement is beyong me. 2) The special effects were pretty amazing, and they entertained me throughout the show! There were laser beams going forming all kinds of intricate patterns, from lightning to death rays to teleportation rays and more. There were columns of flame shooting up so high that we could feel the heat all the way from our seats. There were also fireworks going off every now and then, to punctuate a particularly cool stunt. A word of warning: the noise level was loud at its quietest moments and deafening at its loudest, and you never knew when the fireworks were going to explode, so I found myself jumping in my seat more than once. If you're planning to attend the show with young kids, make sure you bring ear plugs! If you forget your ear plugs, you can roll up a wad of tissue paper and stuff it in your child's ear. Oh, yeah: there's actually a story that ties the whole show together (spoiler alert!). The Nuclear Cowboyz, the good guys (a group of motorcycle riders and kung fu warriors) have been captured by an evil queen and forced to compete against her army -- the Shadow Army, also consisting of motorcycle riders and kung fu warriors -- in the ultimate showdown of good versus evil. The Nuclear Cowboyz win, of course, and in her anger and humiliation, the evil queen prepares to kill her Shadow Army commander. But the Nuclear Cowboyz commander saves the Shadow Army commander, and in gratitude, the Shadow Army joins forces with the Nuclear Cowboyz to destroy the evil queen once and for all. Yes, I did warn you that this was a spoiler alert, but the story doesn't really make a huge impact on the show; you don't need to know the story in order to enjoy the show. In fact, I'll bet that almost all the little kids and probably half of the adults weren't really aware that there was a show. The roar of the bikes and the rock music and the fireworks were so loud, the narrator's voice over was kind of lost in the cacophony! Disclosure: I am a Feld Family Ambassador, and in exchange for my time and efforts in attending shows and reporting my opinion within this blog, as well as keeping you advised of the latest discount offers, Feld Entertainment has provided me with complimentary tickets to Feld shows and opportunities to attend private Feld pre‐Show events. Show information and trivia (in italics) were provided by Feld Entertainment. The views and opinions expressed here are my own. The views and opinions expressed here are my own. Spring break is upon us, and you know what that means: road trips! I'm taking the kids on lots of mini day trips around the area, then they get a special treat the week after, when we all drive down to Anaheim for the Disney Social Media Moms conference! And what better way to get into the Mickey Mouse spirit than by playing Disney songs on the drive down? I've been listening to Disney tunes all my life, and I started collecting Disney cd's in my 20's. I have quite a few of the classics, and in the years since my kids were born, we've amassed a decent collection! They are great to put on during kids' parties and playdates, and the kids like to listen to them while they chill out at home. I also have a Disney running playlist on my phone with my favorite upbeat Disney tunes to inspire me while I run! To celebrate spring, Walt Disney Records (via Entertainment New Media Network) sent me a gift pack of four great Disney cds: the Teen Beach Movie soundtrack, the Frozen soundtrack, the Austin & Ally (tv series) soundtrack, and Disney Channel Play It Loud, a compilation of some of the Disney Channel's most popular tunes. 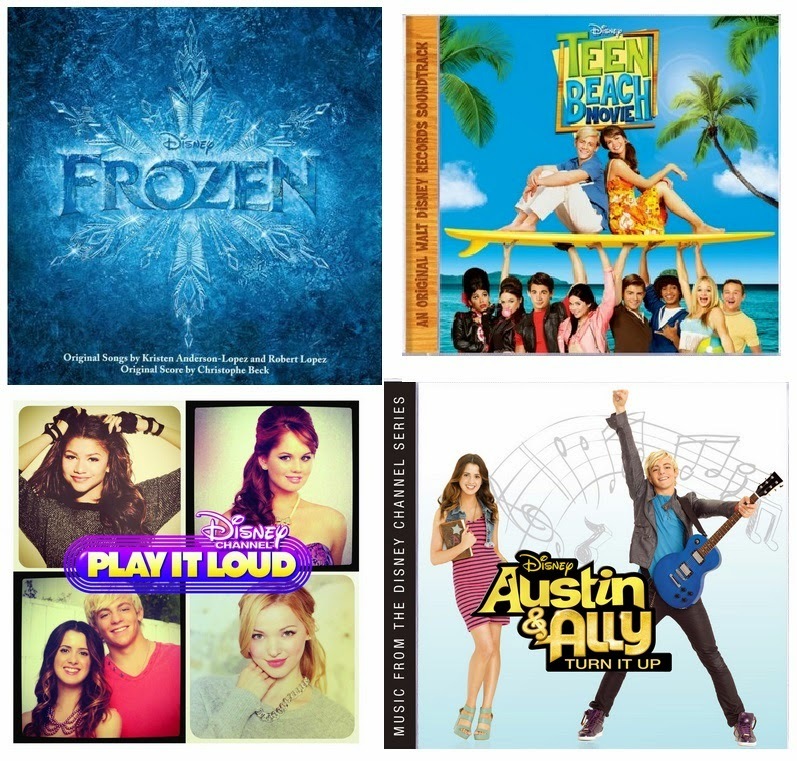 We don't own any of these CDs (except Frozen, I had to buy that right after watching the movie), and the kids love Teen Beach Movie and Austin & Ally, so we were really excited to receive them. Our drive down to Disneyland is approximately 6 hours, but with these CDs the magic and excitement will start as soon as we pull out of our driveway! One lucky Bonggamom Finds reader will receive a set of Disney CDs filled with tunes for preschoolers! 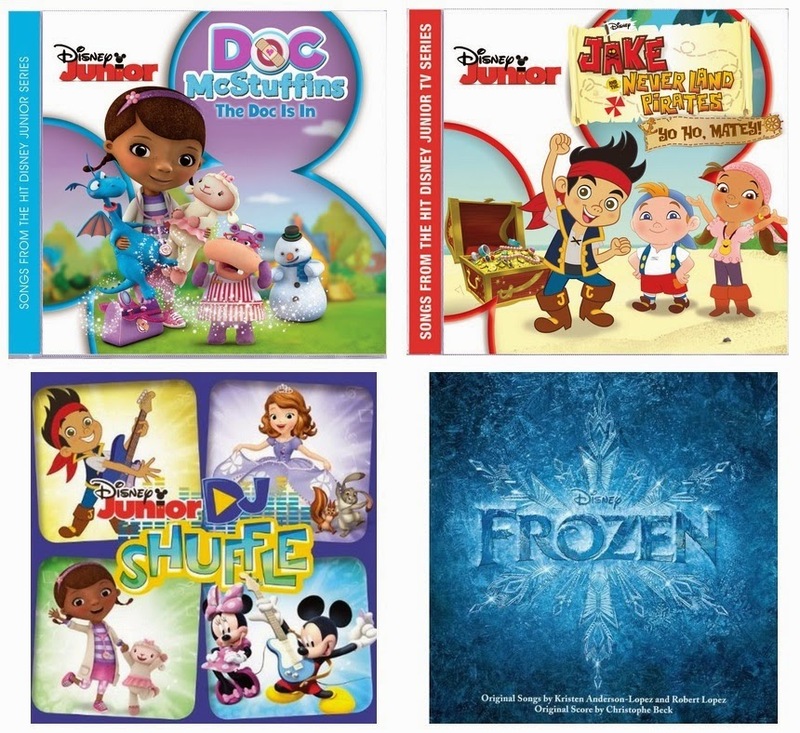 One lucky Bonggamom Finds reader will receive a set of Disney CDs filled with tunes for kids and tweens! Leave a comment on this post and share your favorite Disney tune. Please indicate in your comment whether you would like to receive the preschool pack or the tween pack! This giveaway ends at 11:59PM PST on April 9, 2014; I will draw a winner at random, on April 10 and post their name after they confirm acceptance. Continental US residents only. For additional giveaway rules, click here. 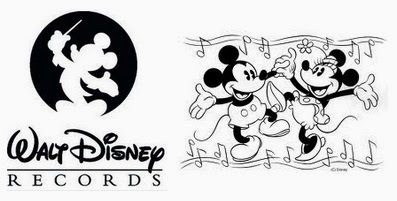 Disclosure:I received a set of cds from Walt Disney Records (via Entertainment New Media Network) and two extra sets of cds to give away.. The views and opinions expressed here are my own. I participated in a campaign for Mom Central Consulting on behalf of Kohl’s. I received a gift card as a thank you for participating. The views and opinions expressed here are my own. Spring is here, and after all the cold and snow and rain, everyone wants to pack up their winter clothes and get a whole new spring wardrobe! If you can't even remember what spring fashion looks like (thanks to the Polar Vortex, all we seem to know is boots and flannel lined jeans! ), visit Kohl's Spring Fashion Hangout. They've got the scoop on all of the latest styles and trends for the season. I'm loving all the pink I see! What trends will you be wearing this spring? Everyone talks about the "glow" that makes every woman even more beautiful during pregnancy. I have no idea what they're talking about. I think they must be talking about an inner glow, because the only "glow" I remember when I was pregnant was the "glow" of being all hot and sweaty! I had bags under my eyes from all the sleepless nights, as well as puffy hands, ankles and face from the extra water retention. In my first trimester, I was so tired, I could barely get out of bed, let alone subject myself to a full beauty routine! However, life goes on, and you learn to adjust. You pull into your arsenal of remedies (chewing pepermint gum and sipping tea), money saving tips (shopping at consignment stores for used baby gear), and solutions to beauty challenges (drinking lots of water actually helps reduce puffiness!). You throw away all the makeup and hair products with lots of chemicals, and turn to natural aids like Gray Away temporary root concealer, made with mineral derived pigments (similar to those found in eye shadow or blush), which makes it safe for everyone to use, even pregnant women! It’s hard enough to make it to the salon every six weeks, let alone every two weeks when your gray roots start to show up again. Whether you have limited time or a limited budget we want to introduce you to the perfect root touch-up solution – Gray Away by EVERPRO Beauty. We all have our little beauty secrets, and Gray Away should be in every woman’s beauty arsenal. * Gray roots start to show only 2 weeks after hair coloring, Gray Away is an easy and convenient way to spray away gray roots instantly. 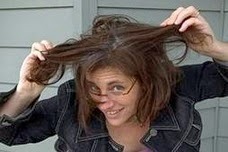 * It extends the life of hair color saving both time and money. * Gray Away does not contain dyes, it contains mineral derived pigments and it is safe for everyone to use, even pregnant women! * Gray Away is a great value ($12.99 for 1.5 oz.) and is available in drugstores nationwide and online. Everyone has their own little treasure trove of beauty tips to help them face the day with style and confidence, even when (or especially when!) pregnant. What tips do you have? In honor of those enterprising women and their creative solutions, Gray Away, the ultimate beauty secret, is inviting pregnant women and new moms around the nation to let down the veil of secrecy and share their best kept beauty tips -- and get the chance to win a year's supply of Gray Away and a $100 Visa gift card in the process! One lucky Bonggamom Finds reader will win a year's supply of Gray Away (choice of light brown or dark brown/black) and a $100 Visa gift card! Leave a comment on this post and share a beauty tip to keep yourself healthy, fit, and glowing through your pregnancy. Also, please indicate in your comment which color you would prefer, light brown or dark brown/black. This giveaway ends at 11:59PM PST on April 14, 2014; I will draw a winner at random on April 15 and post their name after they confirm acceptance. Continental US residents only. For additional giveaway rules, click here. Disclosure: I did not receive a sample or monetary compensation for this post.Giveaway prize is being provided by Gray Away, via The Barry Group. Product information (in italics) is provided by Gray Away, via The Barry Group. The views and opinions expressed here are my own. We're going to Camp EdTech! I can't believe it has been two weeks since The Pea and I got back from our Expanding Your Horizons conference! My mind is still swimming with ways to nurture my kids' interest in science, technology, engineering, and math (STEM). I came back from that conference full of great information, tips, and resources. One of the most useful things I brought back home was a list of STEM opportunities around the Bay Area for the summer. There are so many summer camp providers in the area, it was great to have a list of camps specifically geared towards STEM! Since the conference was held at UC Berkeley, many of the most interesting camps were located around Berkeley and Oakland, which was kind of a bummer, because that's an hour drive for us. Fortunately, several on the list had campuses conveniently located all over the Bay Area -- including a gem right in our own back yard, Camp EdTech! I thought I knew all of the summer camps in our part of town, so I was delighted to discover Camp EdTech. Even more exciting, Camp EdTech is inviting one of my kids to experience a week at camp! Isn't it amazing that kids so young get to do these kinds of activities! It's so great that Camp EdTech introduces kids to these kinds of skills and gets them thinking about the kinds of STEM careers they can pursue! What really excites me about Camp EdTech is that the curriculum was developed with the help of the Children's Creativity Museum and the California Academy of Sciences, two of the coolest museums in the Bay Area! My kids love, love, love, going to those museums because they have so many amazing exhibits and hands-on activities. Any camp activity designed with their help is sure to be a great experience! If your child is younger than the 5th-8th grade range for Camp EdTech, don't despair. The same group that runs Camp EdTech (Edventure More) also has a camp for Pre-K through entering 4th grade! Camp Edmo offers week-long summer camps for kids who love to learn and explore. Like Camp EdTech, the curriculum at Camp Edmo is designed in partnership with the California Academy of Sciences and the Children's Creativity Museum -- so you just know your child is going to have tons of fun! This year's themes for Art and Science include Incredible Edibles (exploring the physical sciences), Magic & Medieval Times (exploring the physical sciences), Critterville (exploring the natural sciences), and Planet Power (exploring the natural sciences). All themes include art and outdoor recreation activities. You're never too young to learn about technology! Campers will create an animated short film from start to finish. Each week has a different animation theme and covers different stop-motion animation techniques. Camps are held in local and regional parks, and campers spend lots of time outdoors, going on hikes, enjoying nature activities, playing games, and completing art and science projects. This year's themes are Bay Camps, Sprout About, Sea Creatures, and Smart Art. What a great way to get your child closer to nature! Check out the Camp EdTech and Camp Edmo websites for more details including locations, times, dates, and prices. Discounts are available for multiple weeks, multiple siblings, referrals, and financial aid is available. Disclosure: I am receiving a free week of camp for one of my children and a discount for additional weeks and/or additional children. The views and opinions expressed here are my own. Peeps has been a part of our Easter celebrations since the kids were babies. 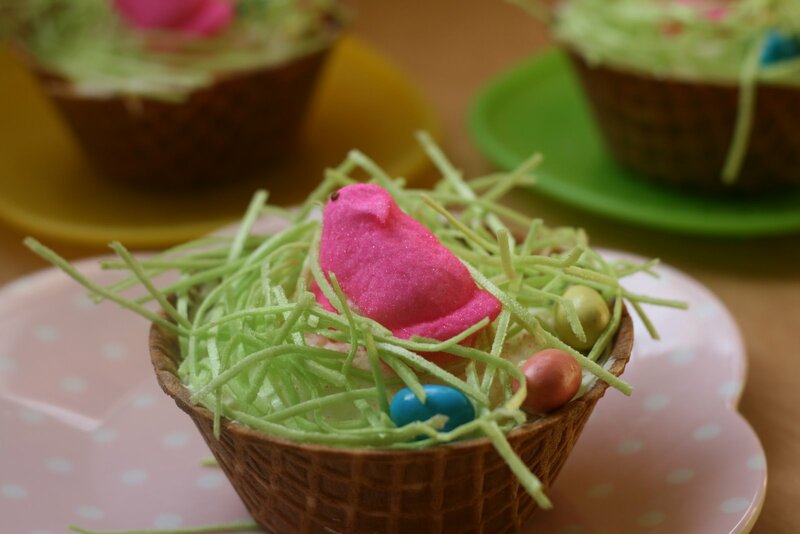 One of our favorite Easter treats is a scoop of ice cream set in a waffle bowl, covered with edible grass, topped with chocolate eggs and a Peeps chick! Peeps are too good to keep to ourselves during Easter -- everyone loves Peeps! They're so adorable and yummy -- not to mention affordable -- so they make the perfect stuffers for any Easter basket. Peeps sent me a gift card so I could check out the Peeps merchandise online and create my own Easter basket. 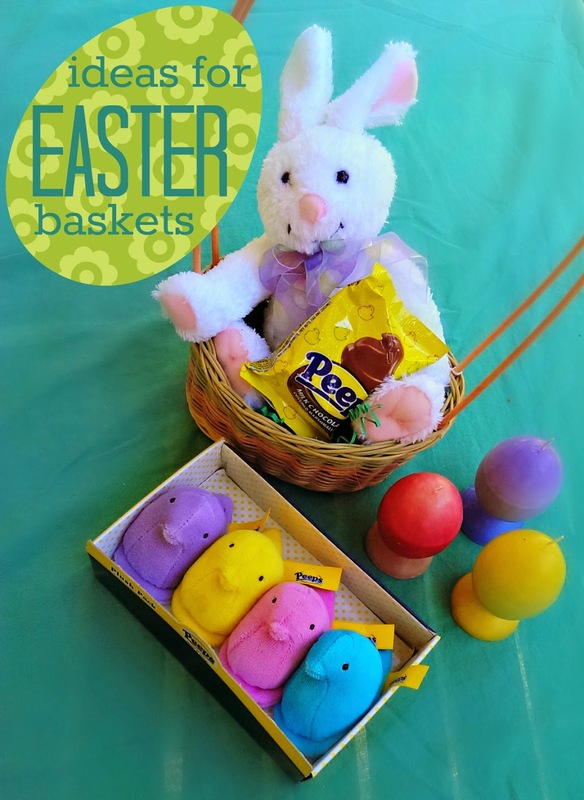 There were so many adorable Peeps candy and products, I was inspired to make several baskets! 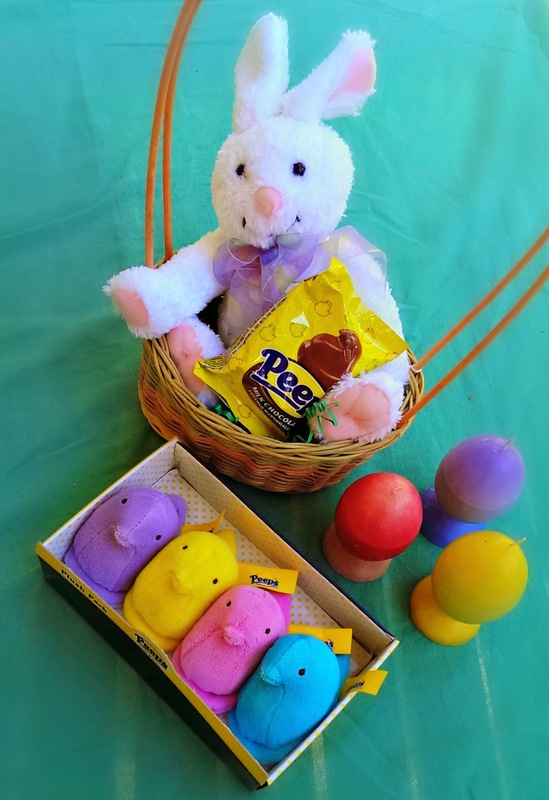 I combined the stuff I bought online with Peeps candy and a few other Easter-themed trinkets that I bought at my local store for some one-of-a-kind Easter baskets that will make anyone's Easter celebration a lot sweeter. The first basket I made below is cute, but inexpensive -- under $10. The tray of chocolate mousse Peeps cost $2.75, and the milk chocolate covered Peep was just $1.00 (I've even found it on sale for 2 for $1.50). 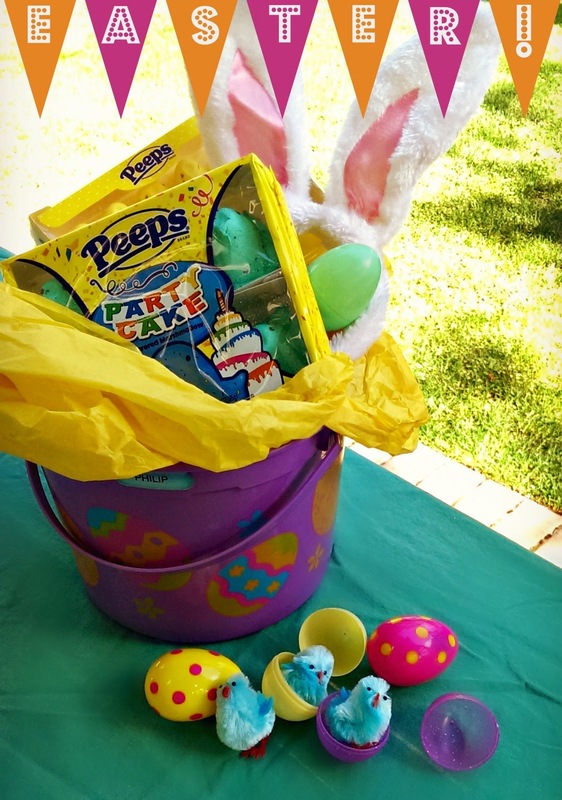 The little chick and plastic Easter egg were just $3, and the basket is one that I've kept over the years, so it didn't cost me anything (you can probably get it for under $5 at a gift store, or check your local dollar store, they have lots of cute Easter baskets!). Total cost for me was $6.75! These days, Peeps come in way more than regular vanilla marshmallow flavor. You can get Peeps marshmallow chicks in yummy flavors like Sweet Lemonade, Orange Cream, Bubble Gum and Party Cake. For this Easter basket, I added regular Peeps, Party Cake Peeps, and Chocolate Mousse Peeps to a plastic Easter bucket. I put a few pompom chicks into colorful plastic eggs and added them to the bucket, along with a pair of bunny ears. So easy, so colorful, so delicious, and so much fun! If you want to go easy on the candy, you can purchase a plush bunny and scented candles in the shape of Easter eggs. Instead of a box of marshmallow Peeps, give a box of plush Peeps! I got this set of adorable plush Peeps chicks at the Peeps online store for $7.90. They also sell a box of plush Peeps bunnies, individual plush Peeps chicks and bunnies (some are larger than small children! ), and other Peeps merchandise like Peeps erasers, magnets, tumblers and more. 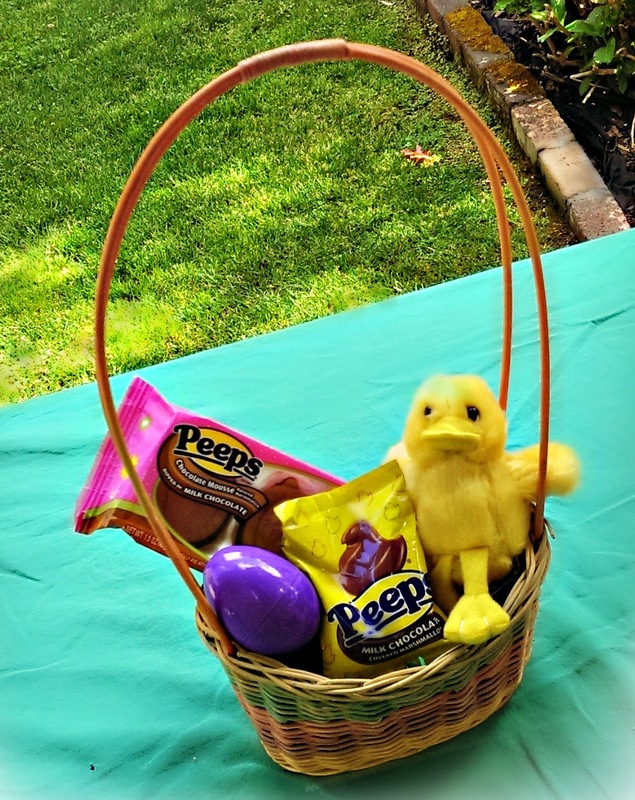 I had to include a chocolate covered Peeps chick because, of course, you can't possibly give an Easter basket without at least one Peep! If you're a true Peeps fan, the Peeps online store has some great caps, tshirts, and other Peeps apparel that proclaim your love of those sweet little chicks. My favorites are the shirts and caps with clever Peeps sayings like "Imagine World Peeps", "Chicks Rule", "Certified Chick Magnet", "One Tough Chick", and "Chillin' with My Peeps". There's something for everyone, from toddlers to kids to teens to adults. 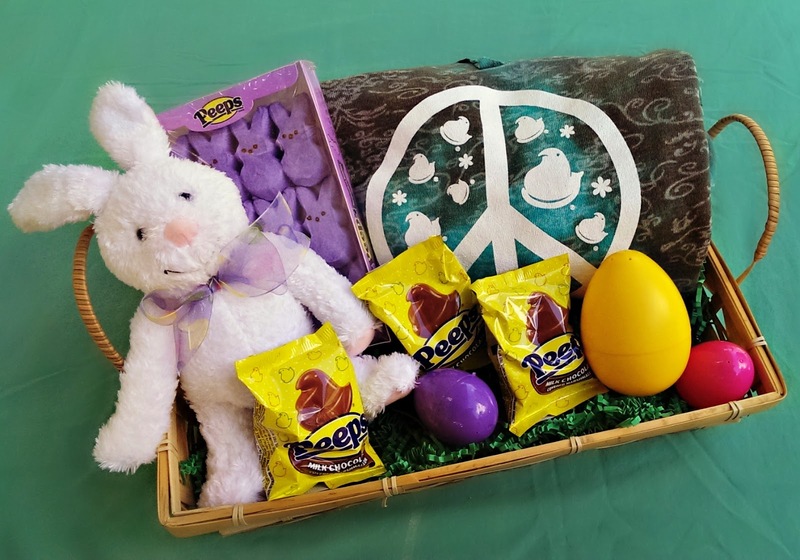 Check out the Peeps online store and find the perfect items for your Easter basket! What will you surprise your peeps with this Easter? Disclosure: I received a gift card to purchase product samples from Peeps.com. The views and opinions expressed here are my own. Your own home -- it's the American Dream, and everyone wants it. Once you're lucky enough to have it, you want to keep looking as beautiful as it appears in your dreams. We're constantly embarking on home improvement projects. Whether it's something big like new kitchen cabinets, new paint on the walls or a new fence, or something small, like a giant magnetic message board for the kitchen or a charging station for all our phones, we're always changing and improving our beloved home. Is an American Dream Home something you fantasize about? What if you could make your home into your Dream Home? AMERICAN DREAM BUILDERS – a new show that premiered on NBC yesterday, March 23 at 8/7c – and Lowe’s want to make your dream a reality. Hosted by famed interior designer and best-selling author, Nate Berkus, AMERICAN DREAM BUILDERS follows the nation’s top 12 designers and home builders as they compete to be crowned the Ultimate Dream Builder and take home a $250,000 cash prize. It’s the home competition that will change everything! From the producers of Survivor and The Bachelor, don’t miss AMERICAN DREAM BUILDERS, Sundays at 8/7c, only on NBC. You could win $100,000 in products and services from Lowe’s and a consultation with the winner of American Dream Builders! Enter for a chance to win your dream renovation at www.nbc.com/lowes. You can also earn 5 bonus entries when you upload a photo and description of a home project you are working on. You can also win more prizes from American Dream Builders and Lowe’s when you follow the show on Facebook and Twitter. One lucky Bonggamom Finds reader will receive a $50 Lowe's Home Improvement Gift Card! Leave a comment on this post and share a home improvement project you are working on, OR describe your Dream Home. This giveaway ends at 11:59PM PST on April 3, 2014; I will draw a winner at random on April 4 and post their name after they confirm acceptance. Each household is only eligible to win One (1) $50 Lowe's Gift Card via blog reviews and giveaways. Only one entrant per mailing address per giveaway. If you have won the same prize on another blog, you will not be eligible to win it again. Winner is subject to eligibility verification.Continental US residents only. For additional giveaway rules, click here. Disclosure: I did not receive a sample or monetary compensation for this post. Giveaway prize, show and promo information are provided by PartnersHub. The views and opinions expressed here are my own. Spring is here, and it's time to tackle our toughest cleaning jobs! 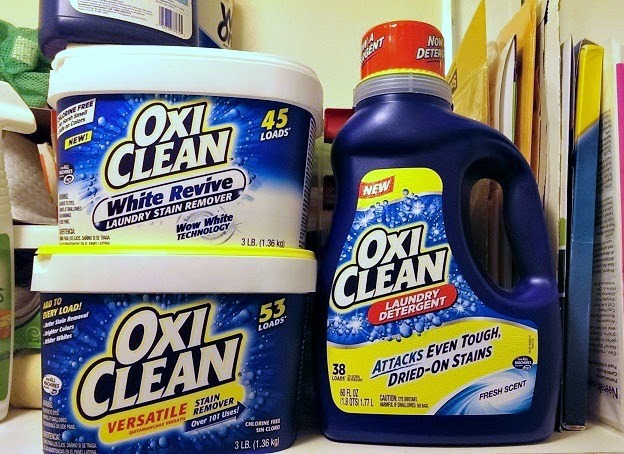 To help me get started on my spring cleaning, MomSelect and OxiClean sent me three of OxiClean's hardest-working products: OxiClean 4X Extreme Power Crystals, OxiClean White Revive Laundry Stain Remover, and OxiClean Laundry Detergent. 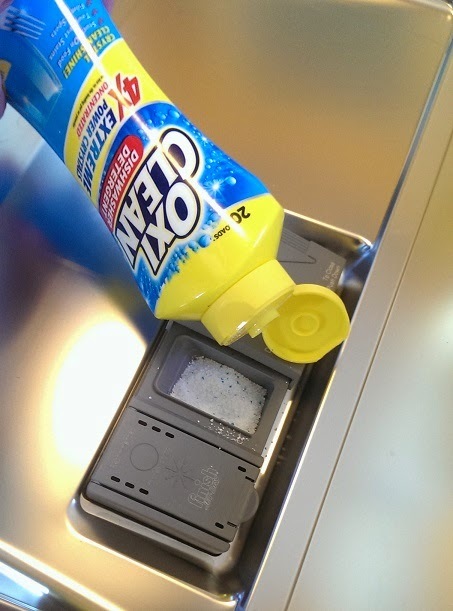 OxiClean 4X Extreme Power Crystals is a dishwasher detergent that breaks up crusted food, cleans dishes, and leaves dishwashers smelling fresh. We received the powder version (they also come in time-saving paks), and I love that it comes in a pourable bottle, so you can pour it directly into the dispenser instead of having to scoop it in -- much less mess! The dishes certainly get clean, but what I really like about using this detergent is that the dishwasher doesn't have a funky smell after it cleans a load of dishes! So often, our dishwasher smells like sulfur (maybe it's the hard water in our area), but I haven't noticed any smells at all since using OxiClean 4x Extreme Power Crystals. The second product in OxiClean's Power Trio is the OxiClean Laundry Detergent. The first thing I noticed about this detergent is how much thicker it is than other liquid laundry detergents I've used. The second thing is how nice and fresh my clothes smell. I'm honestly not a big fan of scented laundry detergent, but with OxiClean Laundry Detergent, I'm left with just a faint, unidentifiable, clean scent rather than the cloying floral or citrus scents that many laundry detergents seem to have. It seems to work well on all kinds of clothes, and in cold water wash as well as hot water wash. 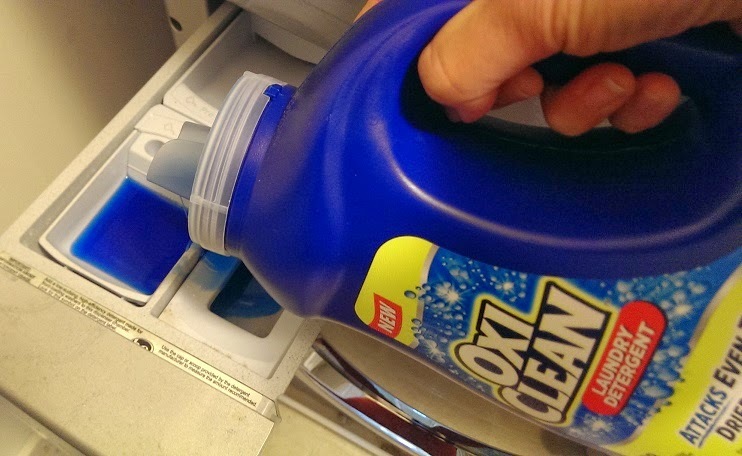 I didn't even realize OxiClean made a laundry detergent, but I will definitely look for it the next time I have to replenish my stock of laundry detergent! 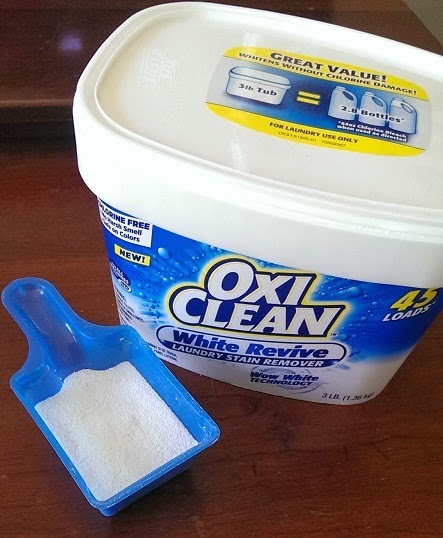 The third product I tested was OxiClean's White Revive Laundry Stain Remover -- and it's my favorite of all! I've pretty much banned my kids from purchasing any white clothing because anything white ends up getting stained and dingy, and no matter what I do, I can't seem to get some stains out. Even if the worst of the stains get out, the white fabric always looks greyish or yellowish. Our regular OxiClean Stain Remover powder is fantastic for removing stains from clothing, but even that has not been able to brighten up our white clothing. The new OxiClean White Revive Laundry Stain Remover changed all that. I tried it on my sons' white soccer jerseys, which have had brown stains on them for years. I dissovled less than half a scoop of the powder in a basin filled with water, then soaked the 2 jerseys in the solution for about 4 hours. I tossed them into the laundry (using the OxiClean Laundry Detergent), and voila! The stains are almost completely gone. The shirts look brighter than ever. Alfie says the difference is really noticeable. Best of all, this product is bleach-free, so I don't have to worry about unsightly bleach stains in our other clothes! I wasn't able to take before and after photos of the boys' white soccer jerseys, so I repeated the experiment with some white socks. 3Po and Jammy have soccer practice three times a week, so their white socks get a TON of abuse. Grass, mud, dirt, you name it, it finds its way onto those white socks. I soaked the socks in a solution of about 1/4 scoop of OxiClean White Revive Laundry Stain Remover and water. After just 20 minutes of soaking, the water was already cloudy and dirty -- the stain remover had lifted up so much dirt from the socks already! 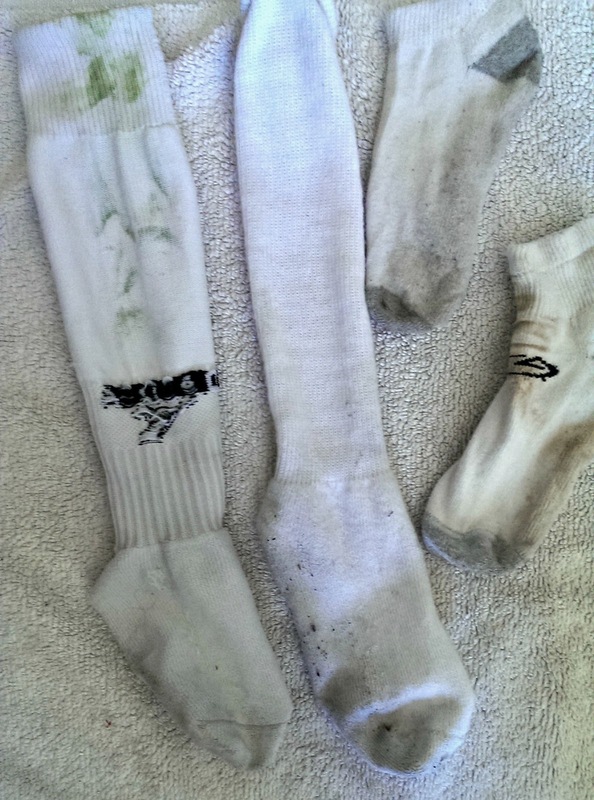 The socks already looked whiter, but there were still lots of areas with dirt and stains. 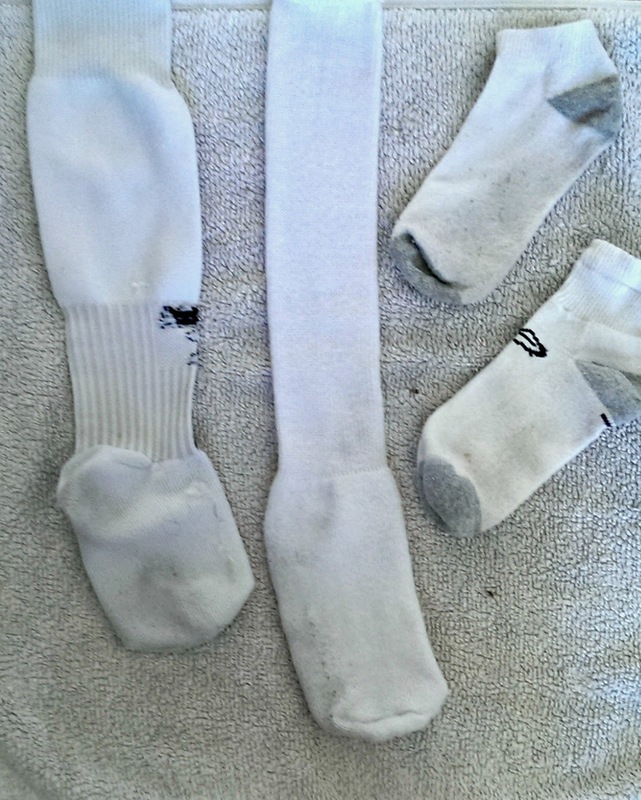 I threw the socks in the laundry along with our other whites, and after the load was done, I took out the socks and inspected them. Grass stains? Completely gone. Dirt and mud? Completely gone. The whites are definitely whiter. Note, the bottoms of the top right sock are still a bit dingy, not completely white .... but maybe with a longer soaking, they'll get there. OxiClean has not let me down yet! Disclosure: I participated in a campaign on behalf of Mom Central Consulting (#MC) for OxiClean. I received three product samples to facilitate my review and a promotional item as a thank you for participating. The views and opinions expressed here are my own. An exciting new show is zooming over to the Bay Area in less than 2 weeks, and we can't wait! 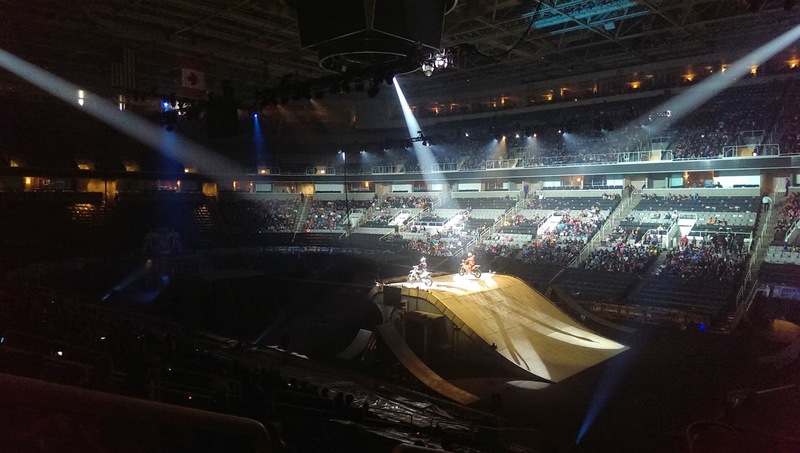 Nuclear Cowboyz, freestyle motocross stunt show, will be playing at San Jose's SAP Center on March 29 and 30. Alfie rides a motorcycle every day to and from work (as well as on weekends), and he loves watching World Superbike and MotoGP races on tv, so the boys have grown up with motorcycles. They love watching videos of motorcycles jumping off ramps, so I know they will love this show. The Pea and I aren't too interested in motorcycles, but I learned my lesson about keeping an open mind after watching and enjoying last month's Monster Jam, and I'm really looking forward to this show. I may not be into motorcycles, but I admire anyone who can do acrobatics and think stunt riders are awesome, so how could I not enjoy a show with people who have perfected both? I expect to be impressed, and judging from the behind-the-scenes video below, I don't think I'll be disappointed! - 30,000 plus hours are spent constructing the scenic environment for the tour. 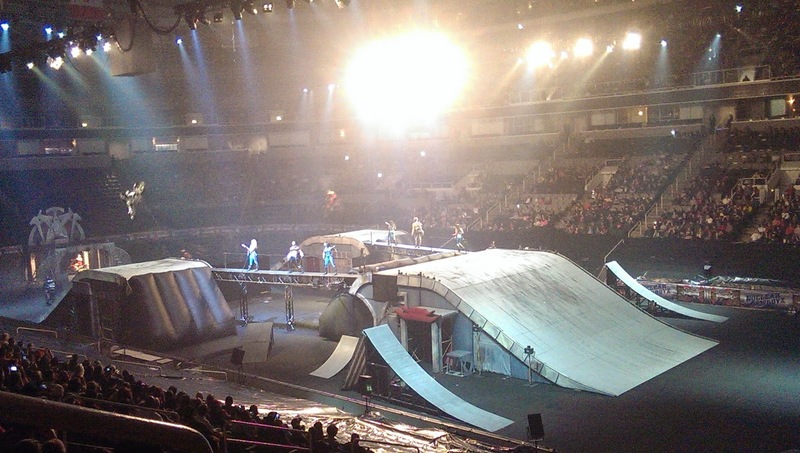 The Nuclear Cowboyz key performance configuration consists of 10 ramps; seven take off ramps, three landing ramps and multiple platforms for the trials riders and acrobatics. - 11 semi-trucks are needed to haul in the show’s scenic environment, bikes and equipment. In most cases, crews begin the load-in process one day before the show and work for 14 hours to get prepared for the show. - Nearly 65 people are required to load in the entire show including: floor surface, lighting, sound, pyrotechnics, set embellishments and ramps. - More than 20,000 feet of turf are used to cover the venue floor to accommodate the set. 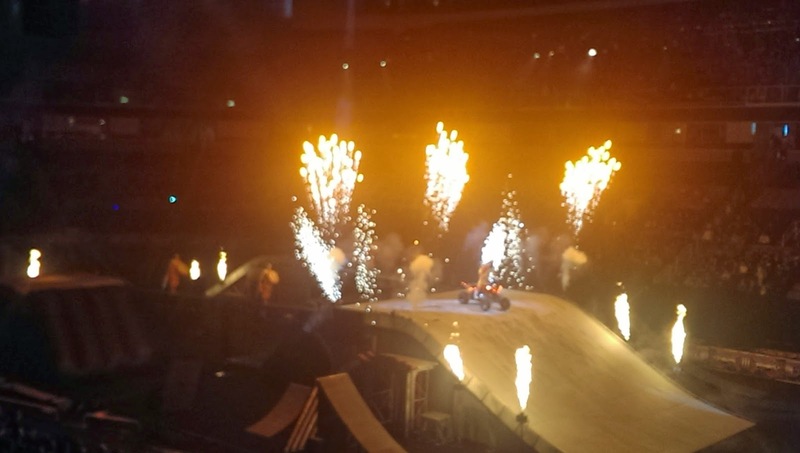 - Nuclear Cowboyz hosts the largest arena-based pyrotechnics shows in the world. There are more than 1000 custom pyrotechnic elements in the production,which are synchronized with music, laser and show lighting. 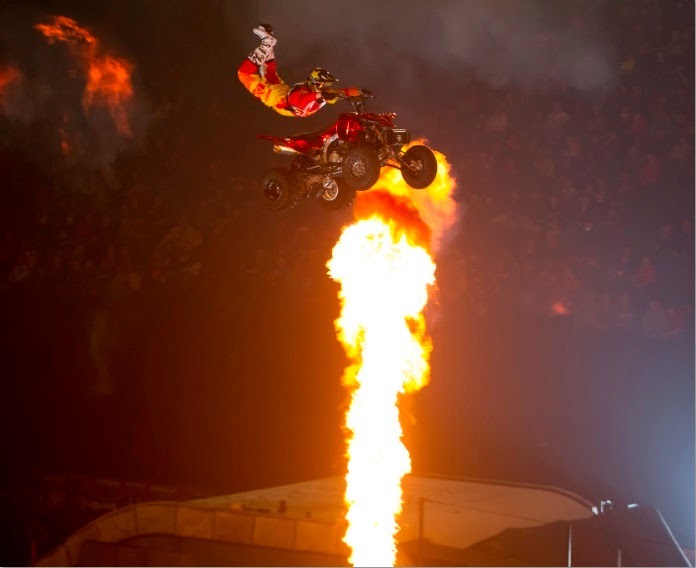 - Nuclear Cowboyz consists of 29 cast members including, FMX riders, quad riders, trials riders, Shaolin Martial Artists, dancers and acrobats. 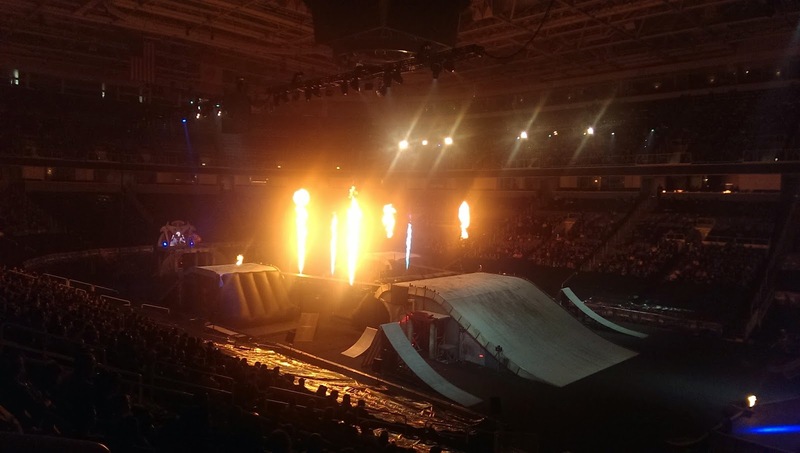 The highly acclaimed 2014 Nuclear Cowboyz® freestyle motocross (FMX) tour is the most explosive choreographed arena-based production in the world featuring the saga of an allied tribe, the Nuclear Cowboyz, whose sole commitment is to defeat an indestructible evil tyrant and her army. Nuclear Cowboyz features a storyline conveyed through more than 1000 gravity-defying freestyle stunts performed by the globe’s most dominant freestyle athletes. The action-packed show is complete with mind-bending performances by world-famous Shaolin Kung Fu Warriors, stunning laser effects, the largest indoor pyrotechnics show and an infectious soundtrack comprised of heavy metal, electronic dubstep and alternative hip hop. Entering its fifth touring year, Nuclear Cowboyz 2014 is led by an award-winning creative team and features the world’s top freestyle motocross athletes, including multi-time X Games medalists Jeremy “Twitch” Stenberg, Taka Higashino, Mike Mason, Matt Buyten, Ronnie Faisst and Colten Moore as well as freestyle heavyweights Derek Garland, Jimmy Fitzpatrick, Nick Dunne, Brody Wilson, James Carter, Marco Picado and more. 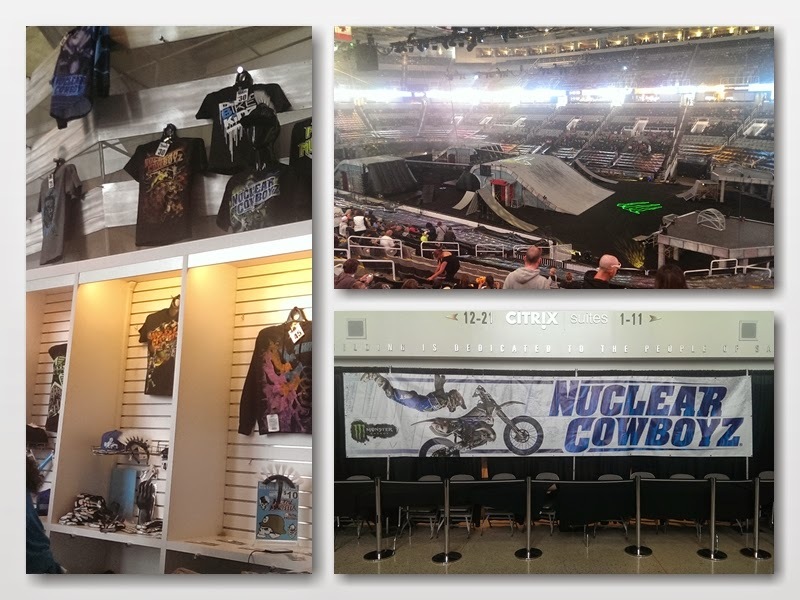 Use code MOM to save $5 on tickets to a Nuclear Cowboyz show. Savings not valid on VIP Fallout Zone or Gold Circle seats. Savings not valid day of show. Disclosure: I am a Feld Family Ambassador, and in exchange for my time and efforts in attending shows and reporting my opinion within this blog, as well as keeping you advised of the latest discount offers, Feld Entertainment has provided me with complimentary tickets to Feld shows and opportunities to attend private Feld pre‐Show events. Show information and trivia (in italics) were provided by Feld Entertainment. The views and opinions expressed here are my own. Spring means new outfits, new fashions..... and new stores! Ross Dress For Less is celebrating the season by opening stores all across the country. You can see the list of new stores in the photo above; for the complete list of Ross stores, go to the Ross Dress for Less online store locator. It's so cool that more people than ever will have to travel a shorter distance to get to their closest Ross store and snag some snazzy spring bargains! Last weekend I went to the new Ross store in Oakland, CA, which opened on March 8. It was as bright and shiny as a new penny, and like all Ross stores, it was crammed with amazing clothes, accessories, shoes, toys, and home goods, all at great prices. Ross kindly sent me a $25 gift card so I could check out their latest selection, and since spring is on its way, I decided to treat myself to a new outfit. 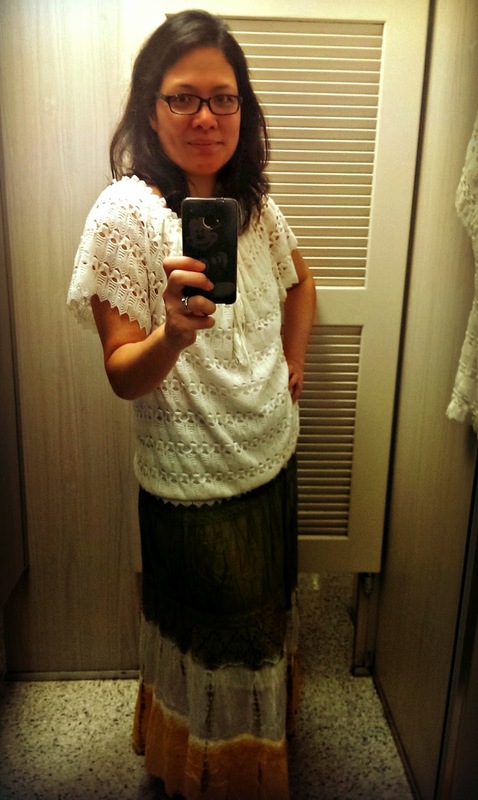 It's not difficult at all to get a beautiful outfit for $25 at Ross, even on designer items! This beautiful multi-color tie-dyed maxi skirt is just $14.99 at Ross, and there are plenty of $6-$10 tank tops to match it with. The peasant blouse is a bit of a "splurge" at $26.99, but the approximate full retail price is $49.99, so half off retail is nothing to sneeze at! 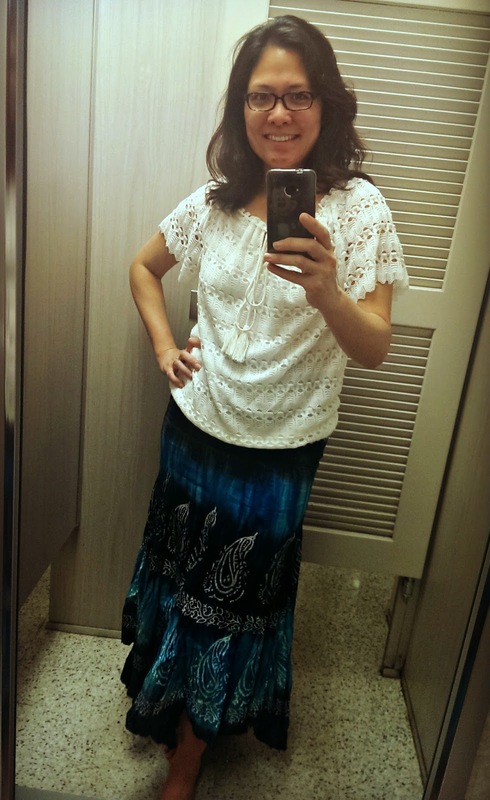 After trying the green toned skirt, I found this lovely blue one -- also $14.99 -- and I must have spent half an hour trying them both on and deciding which one to get! 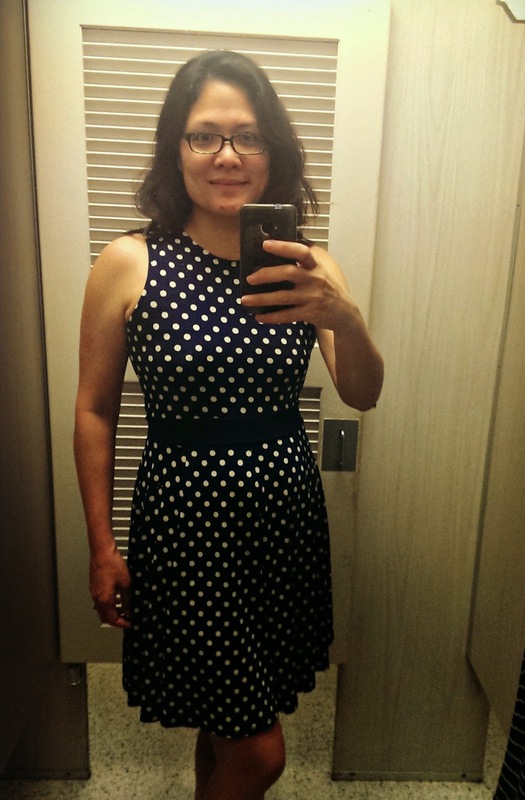 ... but in the end, I couldn't resist a funkier version of the polka dot dress. This one was also $19.99, and it had electric blue dots scattered in a more random fashion. I love the little cap sleeves and the flattering gathered waistline! 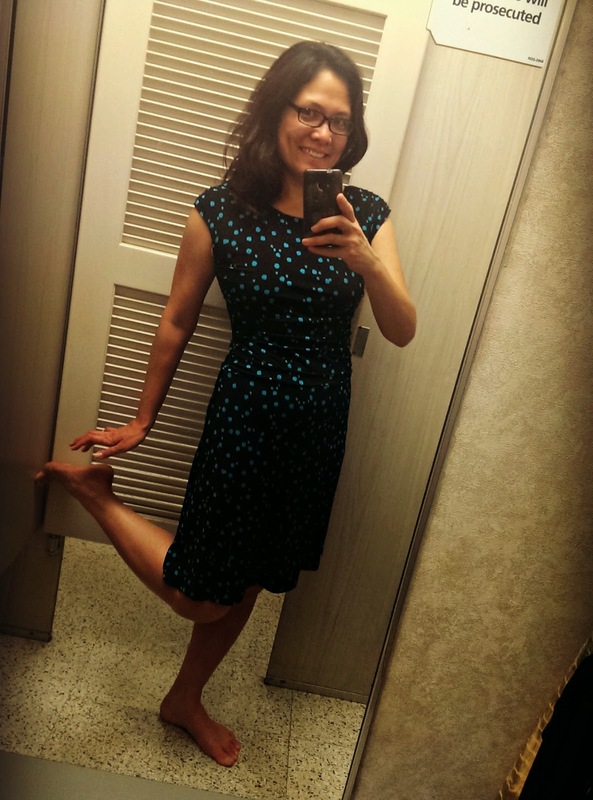 This will be perfect to wear to my blogging conferences in the spring and summer! I also got the green peasant skirt, a white tank top, and a pair of 400-count 100% cotton pillowcases (hey, it's time for spring cleaning, and a couple of our old pillowcases were ripped, and these were only $5.99!!). What kinds of spring bargains will you find at your nearest Ross store? 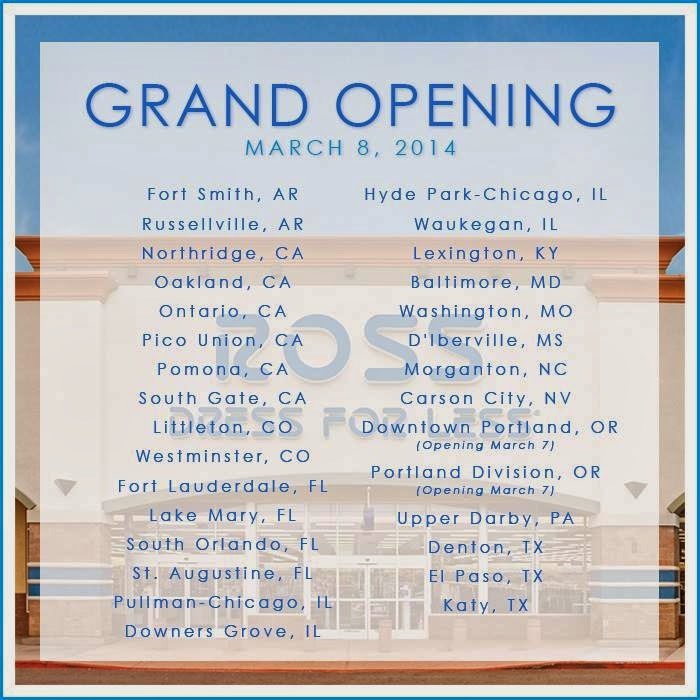 Head over to find out -- and if you live in one of those 30 lucky cities with new Ross stores, you won't have to drive very far! One lucky Bonggamom Finds reader will win a $25 Ross Dress for Less gift card! Leave a comment on this post and tell me what you would buy with your $25 Ross Dress for Less gift card this spring. This giveaway ends at 11:59PM PST on April 6, 2014; I will draw a winner at random on April 7 and post their name after they confirm acceptance. Continental US residents only. For additional giveaway rules, click here. Disclosure: I received a Ross Dress for Less gift card, and a second is being provided as a giveaway prize.. The views and opinions expressed here are my own.